Beautiful Modular home located in the awesome gated Community of Quail Meadows East. 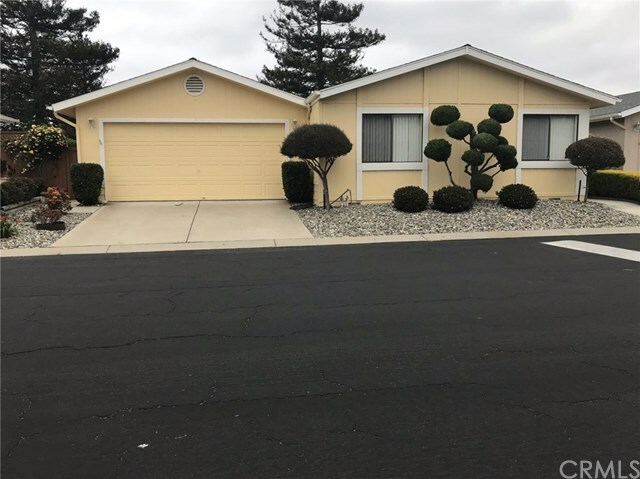 Home features 3 bedrooms, 2 baths, master has double sinks, separate shower plus soaking tub with large walk-in closet, opens to the beautiful backyard, popular plan 4., home has vaulted ceilings, and custom window coverings throughout . New carpet in large living room and master bedroom, beautiful laminated flooring in entry and formal dining room with built-in hutch. Kitchen with new gas cook top, double ovens and breakfast bar plus tons of cabinets. Inside laundry, include washer and dryer plus folding table and cabinets, new water heater Finished 2 car garage with a mans's workshop attached. Siding door from the great room opens to a lovely backyard with large covered patio and skylight, easy care and loaded with lots of concrete, beautiful flowers plus a great producing lemon tree, Mrs. clean live there and a must see. Park features a beautiful clubhouse, pool/spa and large area for SM style BBQ.